Hanging Reverse Crunches (Hanging Knee Raises) and Hanging Straight Leg Raises are some of the best lower ab exercises exercises. In one scientific study, hanging knee raises were listed at the top of the list of effective abdominal exercises. And if you read a fitness magazine, you've probably seen these exercises before, but let's talk about what makes Knee Raises different from Straight Leg Raises. 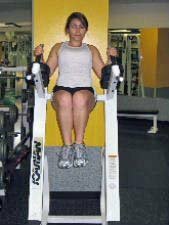 Knee Raises on a Roman Chair, work the entire abdominal region with an extra emphasis on the lower abdominals. I tend to recommend this exercise more often than straight leg raises because straight leg raises put more pressure on the lower back. When you straighten your legs, there are 3 main things that change that make it harder on the back. #1 You increase the weight that you have to lift. Whenever you move your legs, you increase the challenge on your lower back. And when you straighten your legs your ab muscles and hip flexor muscles have to work much harder. #2 You stretch the back of your thighs (hamstrings). If you are stiff and inflexible, you will have to fight against you own stiffness and will have trouble lifting your legs to the correct height. #3 You shorten the muscles in the front of your thighs (rectus femoris/ hip flexor). When your knees are straight, the front of the thigh does not work as well to lift your legs, so the hip flexor muscle that attaches to your back has to pull harder to lift your legs. These 3 things increase the pressure on the lower back. I don't often recommend straight hanging leg raises because most of the people I meet have poor flexibility, poor ab strength, poor overall fitness, and a history of back pain. 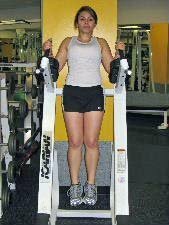 I do feel that hanging straight leg raises can be a great exercise for athletes involved in high level exercise on a regular basis. If you are really fit, have good core strength, and good flexibility hanging leg raises could be a good addition to your core workout program. But for most people, I recommend hanging knee raises over straight leg raises. Okay, here are the instructions for knee raises. You need to have decent upper body strength to perform this exercise. If you can do a set of push ups you should be able to hold yourself in position for the entire set. Starting Position: Prop yourself up onto your elbows, and use your upper body muscles to stabilize your trunk. Form: While keeping your upper body still and against the pad, lift your knees towards your chest. Hold for 1 second at the top, and then slowly lower to the starting position. Personal Trainer Tips: You need to have good upper body strength to perform this exercise. If you can only hold yourself in position for a short time, perform 2-5 reps and take a break to let your upper body rest before continuing the set. Dont allow your body to sag and your shoulders to elevate towards your ears. Hanging reverse crunches are one lower abdominal exercise that I recommend often to people who belong to gyms. 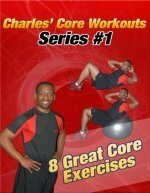 But, if you don't belong to a gym, here are lower abdominal exercises you can do at home.